Vertical Player Repertory, a pioneer of the alternative opera movement in New York City, was founded in 1998 by Judith Barnes. VPR began life in a storefront in Cobble Hill, Brooklyn, bringing an ensemble theatre aesthetic to intimate performances. The 2003 world premiere of composer Yoav Gal’s comic opera The Dwarf brought the company notice in The New York Times feature article “Never Say Die in Indie Opera” by opera critic Anne Midgette. 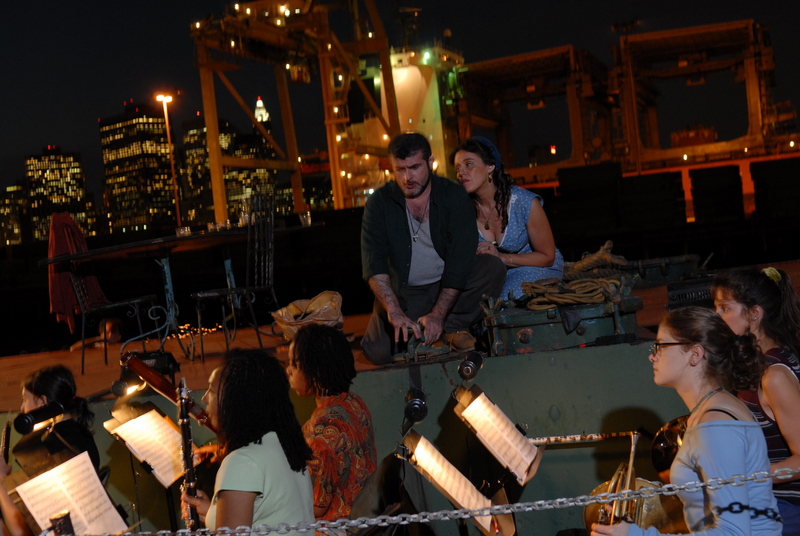 VPR created two site-specific productions outdoors at the Red Hook Container Port in 2007 and 2008, at the invitation of Sal Catucci, CEO of American Stevedoring Inc. Il Tabarro was performed on the deck of the oil tanker The Mary Whalen, and Les contes d’Hoffmann was staged atop tons of raw lumber in an amphitheatre made of stacked shipping containers. These productions brought thousands of people to a spectacular location previously inaccessible to the public. In 2009, port access was restricted nationwide by Homeland Security while VPR was preparing for a site-specific staging of A View from the Bridge, William Bolcom’s powerful opera about Brooklyn longshoremen, to be set on the very Red Hook docks where the story takes place. VPR returned to its storefront venue with a new chamber arrangement of the opera, created in collaboration with the composer. In 2011, VPR brought Francesco Cavalli’s bedroom comedy of the gods, La Calisto, to a post-industrial factory courtyard on the banks of the Gowanus Canal. Repertoire at VPR has included works as varied as Pacini’s Malvina di Scozia, Handel’s Alcina, Mozart’s Idomeneo, Janáček’s Jenůfa and Milhaud’s Médée. World premieres include Yoav Gal’s The Dwarf, Isidore Elias’ original vaudeville Bucky and his Friends, and Opera Feroce’s baroque pasticcio operas Amor & Psyche and Armenio in Armenia. Other pieces VPR has developed include Der Rosenkavalier: The True Story, a hybrid opera-theater reworking of Strauss’ classic with a speaking role for Baron Ochs. The Dwarf, which VPR premiered in 2003, was revived in 2013, directed by Doug Fitch. The Peace, an opera based on Aristophanes’ stinging social satire, by composer Nizan Leibovich and librettist Isidore Elias, is in development. In addition to full operas in varied locations, VPR continues to give intimate performances of opera and recital repertoire as part of its miniatures behind the door series in its storefront venue. VPR has received grants from the Department of Cultural Affairs (DCA), Brooklyn Arts Council (BAC), the Independence Community Foundation, The New York Community Trust, BRIC/Rotunda, The Field, the Ludwig Vogelstein Foundation, and many generous contributions from private donors. VPR is a proud founding member of NYOA, the New York Opera Alliance.